Is there anything more exciting that a cover reveal? Short of the release day itself, I’m hard pressed to think of anything that makes a writer squeal with joy and dash to the nearest keyboard to share their new-found love. 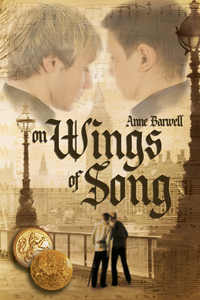 I’m so pleased to be hosting fellow author, Anne Barwell, today as she shares with us the cover for her upcoming novel, On Wings of Song. You can see more of TL Bland’s work at her website. On Wings of Song releases on the 24th December, which is the centenary of the events at the beginning of the story—The 1914 Christmas Truce. I’d had a story percolating in my mind for while that I wanted to write which was set during WWI. With the centenary of the Christmas Truce this year, it felt like the right time to tell it. I love stories set during both World Wars, and the time between them. The Truce also really brought home that men on both sides weren’t very different from each other. I also didn’t want this story to favour one side or the other. Instead it needed to be about two men—one German, one British—who each found a kindred spirit in the other, although they were fighting a war on opposite sides. Music is a universal language, and Aiden’s singing unites both sides as one, for a brief poignant moment. I’ve played for musical theatre—the modern equivalent of music hall—both as a rehearsal pianist and as a violinist in the band. One of the shows I played in had an ANZAC theme, and commemorated WWI and II. Another show celebrated the music played in music halls in the late nineteenth, and early twentieth century. Once Aiden and Jochen meet, and also share their love for literature, all the pieces of the story come together On Wings of Song. Oh, I am such a sucker for historical romances, particularly set in WW1 and WW2! I am looking forward to this release, Anne! What a lovely cover for what I am sure will be another awesome story from you! It was entirely my pleasure, Anne. Happy to have you here anytime.